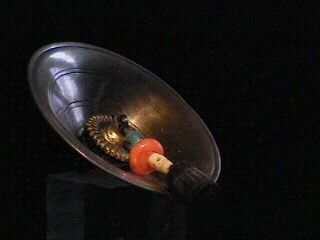 The ritual upturned flat hand bell of the Bonpo Shamans, made of a consecrated metal alloy, and used to 'throw' or 'cast' thoughts. 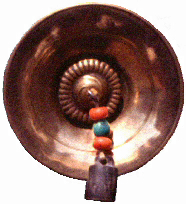 Symbolically similar to the dril-bhu used by Tantrist Buddhists.Used in conjunction with a phurba in rites involving dkyil-khors and Thread Crosses. 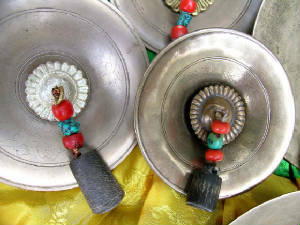 The Shang consists of 3 main pieces: the flat bell, the center piece that holds the knocker which is called a 'Gakyil' ( Wheel of Joy ), and the striker or knocker which is made from animal horn. The origin of the Shang begins with the ancient Kingdom of ZhangZhung nearly 18,000 years ago. Sizes range from approx. 3" to 20" in diameter. Used by Asian shamans in healing rituals and used in ceremonies today by practitioners of Yungdrung Bon.